many other Lions sponsored charities. Every dollar we raise in the community is donated to charity. The West Charleston Lions Club Foundation is a Charitable Corporation under 501(c)3 of the IRS code. The first All-Star game was held on Saturday, August 5, 1972 when it was a cool 105 degrees on the playing field. Robert Lopez from “little” Lincoln County High School in Panaca, NV was the MVP of the game which the West won 7-3. Since then, the All-Star Game has become one of the highlights for high school senior football players and coaches in Southern Nevada. For most of the players, it’s their last chance to showcase to the “home town” fans their abilities, sportsmanship and love of the game. 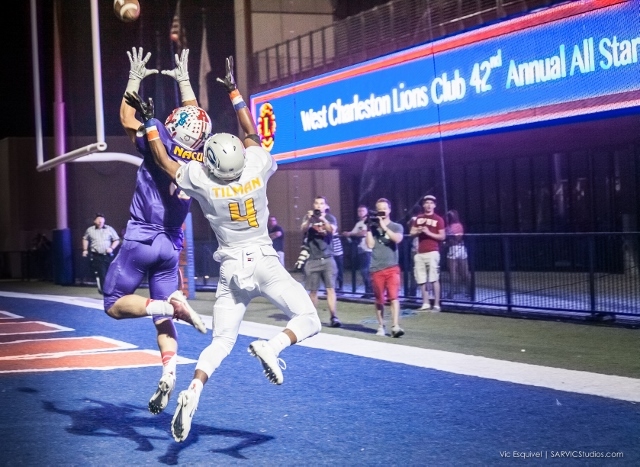 Charter President of the West Charleston Lions Club (WCLC), John Duncan, developed the idea for the All-Star Game in 1971, along with club members Dwight Chambers and Clint Wright. The idea was well received by Coach Angelo Collis of Las Vegas High School. The Lions were assisted with the organization of the game by Coach Joe Blockovich, President of the Southern Nevada Coaches Association, Dr. Kenny Guinn, Superintendent of Clark County Schools, and Bob Lunt, General Secretary of the Nevada Interscholastic Activities Association, along with Chub Drakulich and Roger Barnson of UNLV’s Athletic Department. There have been many other renowned athletes and business leaders who have participated in the WCLC Charity All-Star Football Game, Southern Nevada’s longest running charitable event.